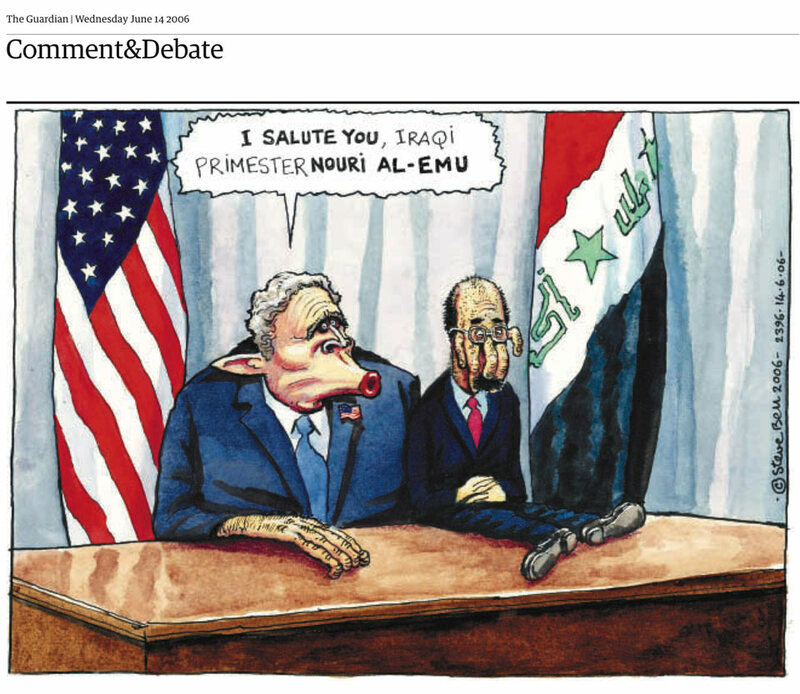 On Nov. 16, we posted about a political cartoon in the Guardian by Steve Bell, Nov. 15, depicting British foreign minister, and former PM Tony Blair, as puppets being controlled by Israeli PM Netanyahu, in the context of expressions of support for Israel from both British leaders during operation ‘Pillar Of Defense’. 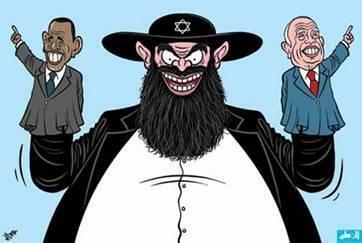 We noted the strong similarities to other cartoons evoking the historical canard that Jews secretly control non-Jewish world leaders, such as this from 2008 in a Saudi paper depicting a sinister Jew controlling both McCain and Obama as puppets. 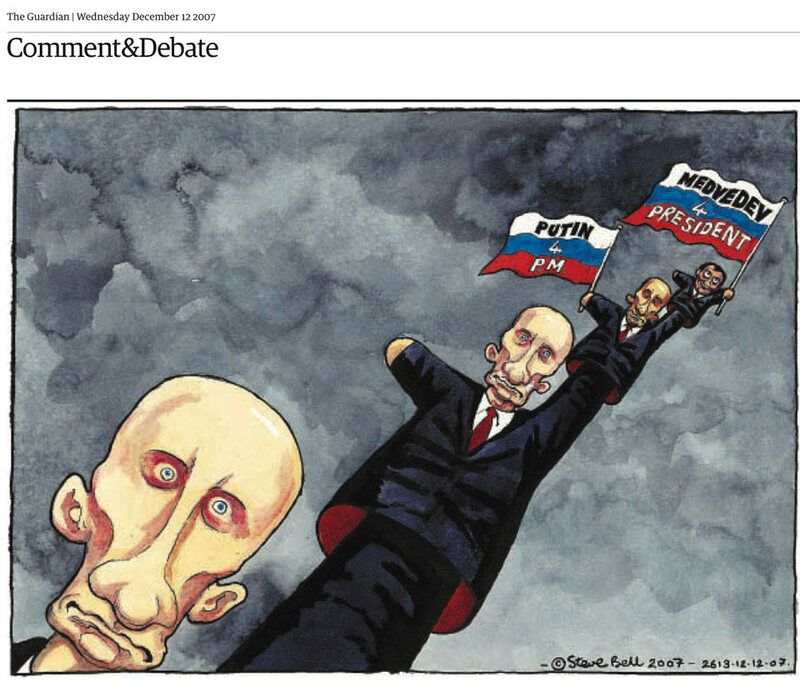 On Sun, Nov. 25, the Guardian’s readers editor, Chris Elliott, addressed the row in a column titled ‘The readers’ editor on… accusations of antisemitism against a political cartoon’. At the time of writing there have been more than 30 complaints, including one from the Community Security Trust (CST), which advises the UK’s Jewish community on security and antisemitism issues. One complaint to the readers’ editor’s office ran: “Whatever disagreements Bell wishes to express regarding Israel‘s current actions against Hamas rocket fire, this picture uses classic antisemitic iconography that should have no place in your newspaper. “The echoes of such iconography are obvious: powerful Jews controlling western politicians for their own nefarious purposes. 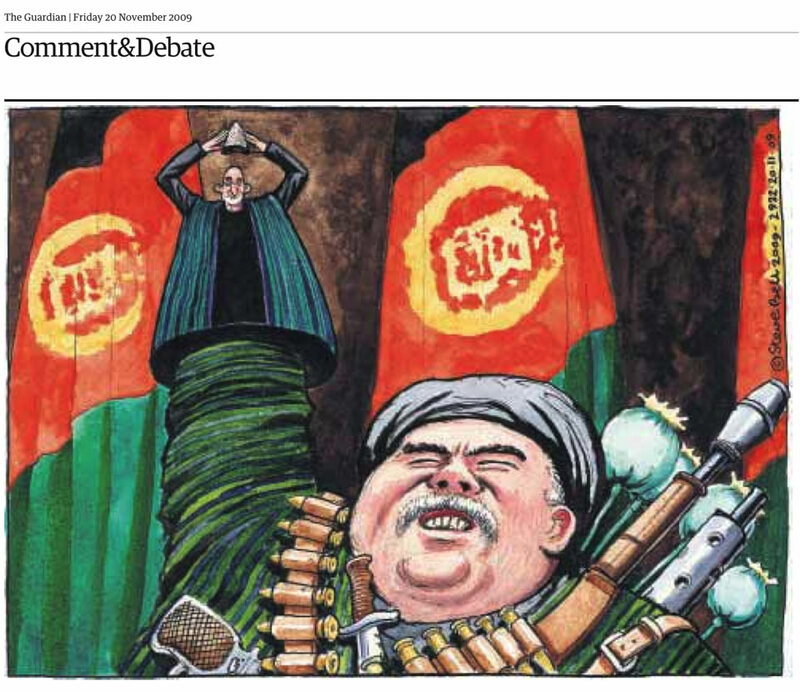 Bell himself is adamant that the cartoon, based on an agency picture of a Netanyahu press conference, is neither intentionally, nor unintentionally antisemitic. There are two paths to the argument about the imagery of the cartoon. The first is that it is an incontrovertible fact that, during the 1930s and 1940s, Nazis and their supporters deployed propaganda devices about Jews. One of those images was that of a grotesquely drawn Jew shown as a puppeteer, with exaggerated features, as in the cartoon portraying Churchill, Roosevelt and Stalin as puppets of the Jews in a 1942 issue of the Nazi paper Fliegende Blätter. The image of Jews having a disproportionate influence over the US and British governments has often been replicated by anti-Jewish cartoonists in the Middle East since the end of the second world war. Secondly, one of the difficulties is that pictorial stereotypes are the stock in trade of a cartoonist, an aspect of caricature that has an entirely legitimate centuries-old tradition. Bell has used the theme of a puppet master on many occasions in the past to represent his view of Presidents Mubarak and Putin, as well as leaders in Iraqi and Afghan politics. I don’t believe that Bell is an antisemite, nor do I think it was his intention to draw an antisemitic cartoon. However, using the image of a puppeteer when drawing a Jewish politician inevitably echoes past antisemitic usage of such imagery, no matter the intent. While we would have preferred that the cartoon be taken down, it’s encouraging nonetheless that Elliott warned journalists and cartoonists to avoid language and visual language conveying antisemitic stereotypes. Finally, here are a few cartoons Bell published previously at the Guardian so you can gain some context on the current row. 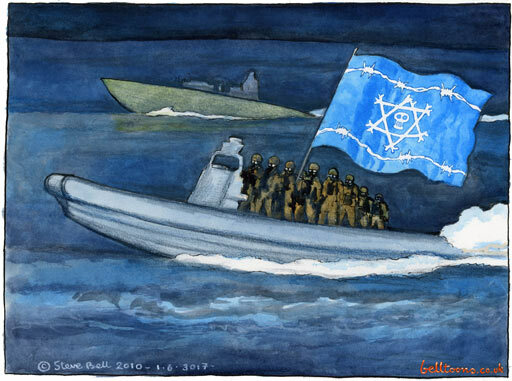 Jun 1, 2010” This cartoon by Bell was published at the Guardian in the aftermath of the Mavi Marmara incident and titled “Israeli troops confront flotilla activists”. Israel, for Bell, is a sinister, controlling and manipulative state, and, as an artist, he certainly doesn’t seem too interested in subtitles or nuance. 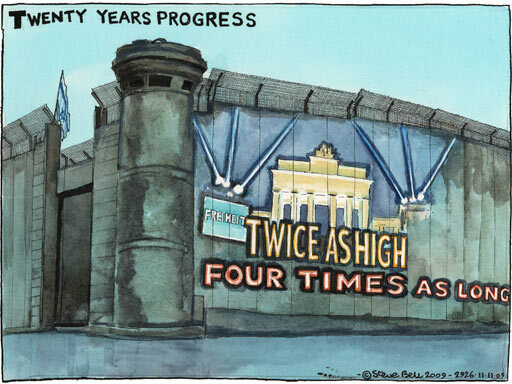 We don’t know what’s in Steve Bell’s heart regarding Jews, but it does seem that his “cheap”, “superficial” pictorial characterizations of Israel arguably suggest a baffled and bewildered political cartoonist trying desperately to bring narrative order to the behavior of a country which frustrates and confuses him. Once again, The Guardian shows itself to be little more than a glorified version of Der Stürmer. Israel’s ‘behaviour’ isn’t difficult to comprehend, given the stated aims in the Hamas charter and the publicly stated aims of many Arab countries of their desire to ‘annihilate’ Israel and ‘kill every Jew’. No one has the right to be that ignorant. To blame his readers -“I can’t be held responsible for whatever cultural precepts and misapprehensions people choose to bring to my cartoon” – is cowardly and dishonest. So the ‘cultural precepts’ are known to his readers but Bell is innocent and ignorant of them? The problem with people like Bell is that they have no real ammunition against Israel and so resort to working in the gutter. Disgusting. And Jewish lives are lost because of this. I was about to give Bell the benefit of the doubt – until I saw that last cartoon. Call me crazy, but I’m looking at barbed wire, death and concentration camps. Will Bell draw a cartoon about the egyptian voices against ElBaradei “rude” marks about their obvious Holocaust denial? Reading Gyongyosi’s speech in the Hungarian papers makes it perfectly clear that he’s saying exactly what Bell and his Guardian employers. And I have serious doubts that they are the least disturbed by the fact that they are in the same bandwagon with the neo-Nazis. I’m with Winnie on this. Bell’s defense of his cartoon is almost as immoral as the cartoon itself. He uses a tired old antisemitic piece of paranoia and then pretends not to know what it is or where it came from! After the web attack at Israel one week ago by presumably Anonymous, another try. Iranian? The last ten, twelve years the web has been awashed with antisemitic websites, cartoons, blogs etc. set up by Arabs, Iranians, Islamic organisation, Russian, East European, Swiss, Austrian, …left extremists and right extremists. And the nerds on their keyboards take that propaganda for real and act accordingly. It is time to pull the plug off their Second Life. Maybe then they get real. 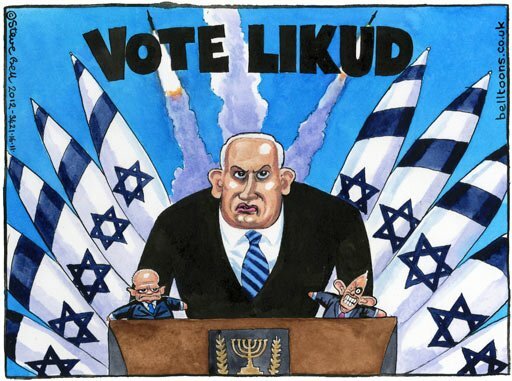 There was an excellent analysis of why this cartoon was not valid political satire by a commenter on another blog- namely that any factual basis for Netanyahu being the puppet master of Blair and Hague is completely absent: there is nothing of that nature in current political discourse anywhere except on the rabid antisemite fringes of the political spectrum. It made no political sense. So what was left was a lazy use of old imagery from the hoard in the antisemite’s attic. Amie, exactly, and notice that Bell doesn’t try to explain how it is that this particular Jew, Netenyahu, controls British foreign policy. It is bigotry so visceral that it doesn’t even factor as an ideological positon that he needs to qualify. It is indeed an image that taps into the deep seam of hatred that has formed Europe’s cultural traditions and identity, and Bell is a true son of those ‘progressive’ values. Not been here from a while. Glad to see the revamp, although the silly popularity contest on comments is still here. The article in question is trademark mock outrage. The Saudi picture is clearly anti-Semitic, depicting an anonymous sinister Jew controlling Western leaders. The Cartoon depicting Bibi is not anti-Semitic. It depicts Bibi, a man who as previously boasted of his ability to control Western leaders. Find some actual anti-Semitism to be outraged about. Poor Meitner, jobless again, but – no wonder considering his cognitive abilities.